The Future of Storytelling Trailer from latddotcom on Vimeo. 78 percent of people want to “friend” a character digitally – meaning they would receive updates via platforms like Facebook or via SMS – and would like to be able to sway the outcome of a particular decision, as they would with real friends, perhaps. Other findings included that 87 percent of people want to be able to get more perspective on a story by seeing through a particular character’s eyes or changing the point-of-view altogether and switch to a different character. For those of us creating works for children and teens, this study brings up a lot of questions - and perhaps, inspiration. I've enjoyed being a Cybils judge several times, and this year, I decided to use the opportunity to help me grow as a writer. And what I'm doing in my super-sneaky way is I'm using this opportunity to learn a TON about the kinds of books I want to write! And you can, too. It's like an advanced course in writing to a certain form or genre. And I'm using the Cybils nominations as my starting point, but you could do this with any great list of books, such as the NCTE Notables list, the National Book Awards long list, Bank Street's Best Books of the year, etc. ° Pick the Cybils category [http://www.cybils.com/] that features the form you want to learn more about. There are 11 to choose from. ° Find a partner! Buddy up with at least one other writer who also wants to improve his or her work in this particular genre. If you can get 3 or 4 other writers, even better. I feel so lucky that, as a Panelist, I have a whole group of easy reader experts (teachers and librarians, mostly). I know I'll learn bunches from them. ° Get the list of nominated books. In the first right sidebar on the Cybils site, where it says 2013 Nominations by Genre, click on your chosen category. ° Decide how many books you want to read. If you're doing a shorter form, like Poetry, Picture Books, or Easy Readers, read ALL the nominated books. 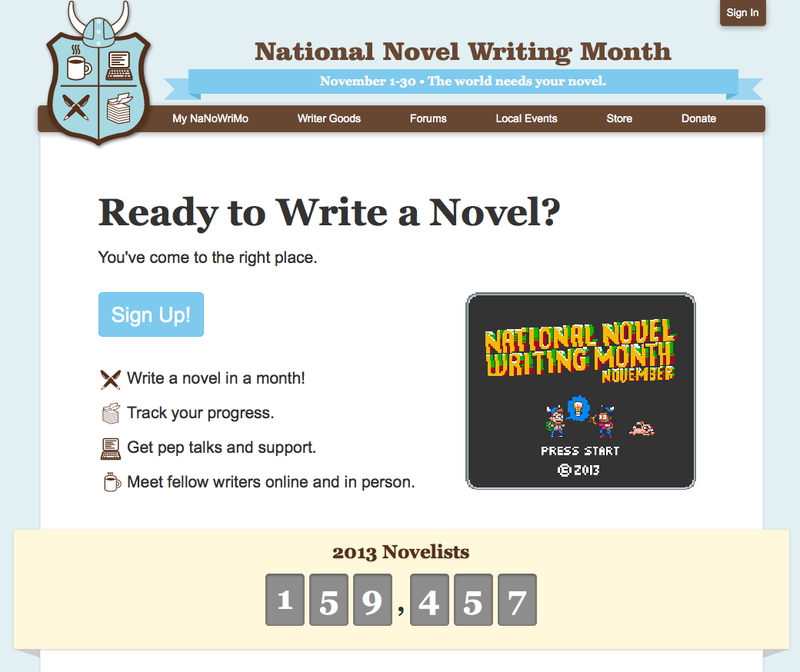 If you're doing novels, maybe you want to pick a limit, like 30 books or something. Contact your library and put all of the nominated books on Reserve or request them through Interlibrary Loan. You and your partner should read the same books. ° If you're on Goodreads [www.goodreads.com], start a Cybils 2013 shelf to keep track of your reading. ° Start a folder for your reading notes. ° Decide what features you want to concentrate on. What are the areas of weakness in your own writing? My struggle with easy readers / early chapter books is structure. Sentence structure, scene structure, book structure. So that's my strong focus as I do my reading. ° Document each book as you read it! 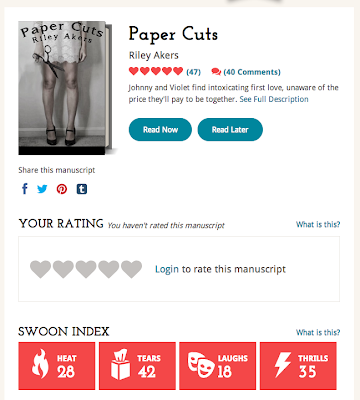 Rate it in Goodreads and, either in Goodreads or in separate documents, take notes. I start with the title, author, publisher, and page count. For the books I really like, I'm typing out the book (if it's truly a beginning reader) or a portion of it (if it's longer). Typing it out really gives me a physical feel for it and helps me absorb the structure. 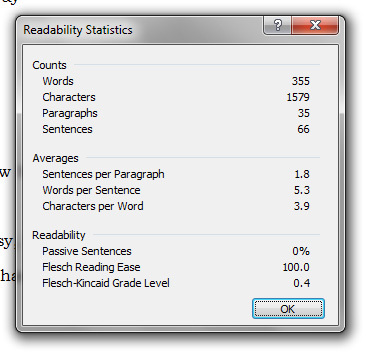 After I type part of it out, I run Word's readability stats on it. ° I'm doing this because reading level is pretty relevant to this specific category. In many other categories, I wouldn't bother with that. I also go to Renaissance Learning [http://www.renlearn.com/store/quiz_home.asp], where I can often find the word count of the entire book. ° Then I jot notes about what I liked and didn't like. What was fresh or stale? What did I notice that was the same or different from other books in this category? And if I only typed a portion of the book, I jot down a ONE-SENTENCE summary of each chapter. That helps me see how the main plot is structured. ° Spend a week or two debating and discussing with your partner once you've read all the books. Come to an agreement on the 5-7 top books out of all that you've read. Discuss the pros and cons of each title. It's interesting to see what you both dismiss immediately and what stays on the table. If you can, crown your very own Super-Sneaky Cybils winner in your chosen category! ° Think about and analyze what you found. This is the most important step of all! Re-read your notes. Look for common threads. Actually write down a paragraph or two about what you learned and what changes you want to make to your own writing. SCBWI is partnering with the Authors Guild to organize and curate the Children’s Book section of Booktalk Nation! 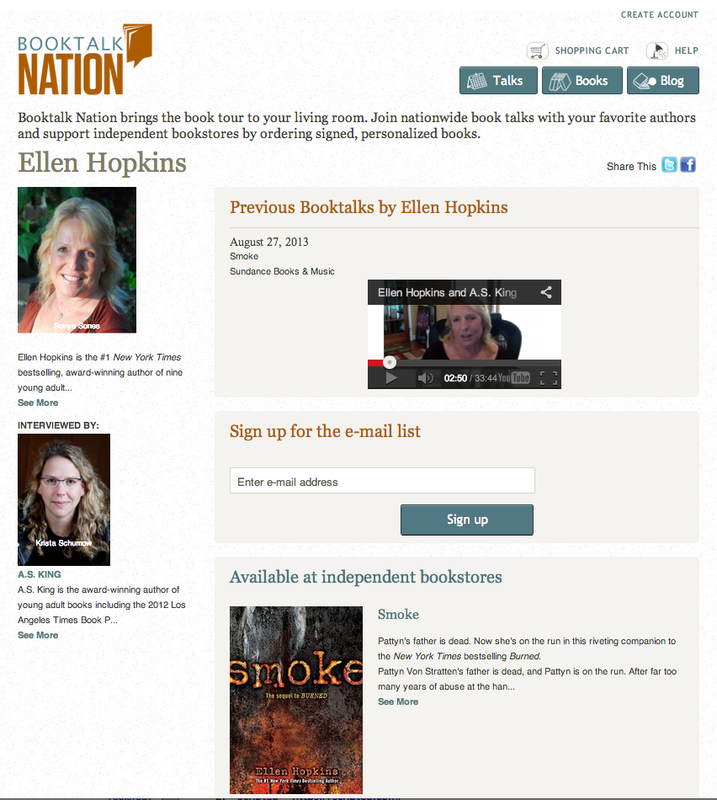 Booktalk Nation puts on live, streaming author talks that are free to the public. The idea is to bring book talks to readers' living rooms and help out brick-and-mortar bookstores in the process. Readers can sign up for free and buy signed, personalized copies of the author's book from an independent bookstore hosting the event. 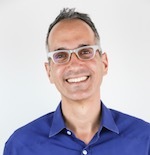 Authors can participate in the talk from their home via phone or Internet; they just need to be able to sign books at the host store a few days after the talk. The talks are about thirty minutes long, and usually involve a featured author being interviewed by another author or journalist. It's a great way for authors to supplement their book tours and to support their local independent or one they will be passing through on a tour. There is no cost to participate in Booktalk Nation. SCBWI members are eligible to be considered for this program. 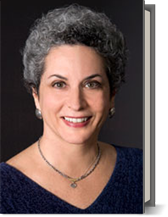 So far Judy Blume, Ellen Hopkins, Lin Oliver and Henry Winkler have participated - and Bruce Coville will be interviewed by Ellen Yeomans about his latest title, "Paula Danziger's Amber Brown Is On The Move" today - Thursday Nov 21, 2014 at 7pm Eastern, 4pm Pacific time in the USA. Coming up, Jane Yolen will be interviewed by Heidi Stemple on December 4, 2014 about Jane's most recent, "How Do Dinosaurs Say I'm Mad?" SCBWI will select 4 people to participate in 2014. Book Talk Nation offers great talks to tune into live - where you even get to ask the authors questions! - as well as an impressive archive of previous talks to explore! Check it out. 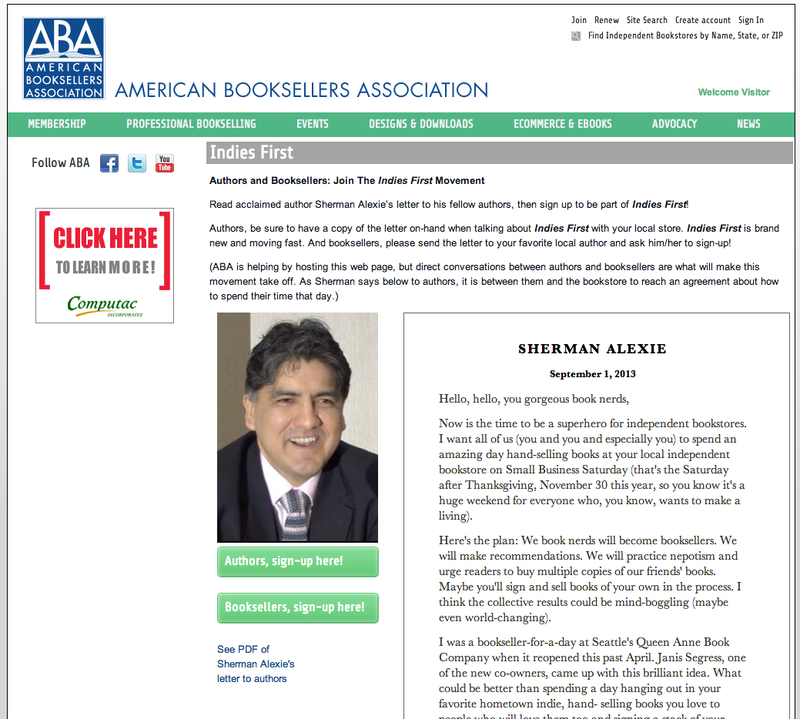 Sherman Alexie has cooked up a great idea, and the American Booksellers Association is helping out. Now is the time to be a superhero for independent bookstores. I want all of us (you and you and especially you) to spend an amazing day hand-selling books at your local independent bookstore on Small Business Saturday (that's the Saturday after Thanksgiving, November 30 this year, so you know it's a huge weekend for everyone who, you know, wants to make a living). Here's the plan: We book nerds will become booksellers. We will make recommendations. We will practice nepotism and urge readers to buy multiple copies of our friends' books. Maybe you'll sign and sell books of your own in the process. I think the collective results could be mind-boggling (maybe even world-changing). I was a bookseller-for-a-day at Seattle's Queen Anne Book Company when it reopened this past April. Janis Segress, one of the new co-owners, came up with this brilliant idea. What could be better than spending a day hanging out in your favorite hometown indie, hand- selling books you love to people who will love them too and signing a stack of your own? Why not give it a try? Let’s call it Indies First. If you want to participate, visit the Indies First site to sign up. ps - My thanks to Sarah Laurenson for sharing this news with me, so I could share it with all of you. Following the terrible events in the Philippines, AUTHORS FOR THE PHILIPPINES aims to raise money for the Red Cross Typhoon Haiyan Appeal. Once the auction goes live (Wednesday morning, 13th November) you will be able to bid on the items via the comments on the individual posts. Once the auction has ended (Wednesday 20th November), we will contact the winning bidder and ask them to donate the funds directly to the Red Cross and send the confirmation of payment to us. 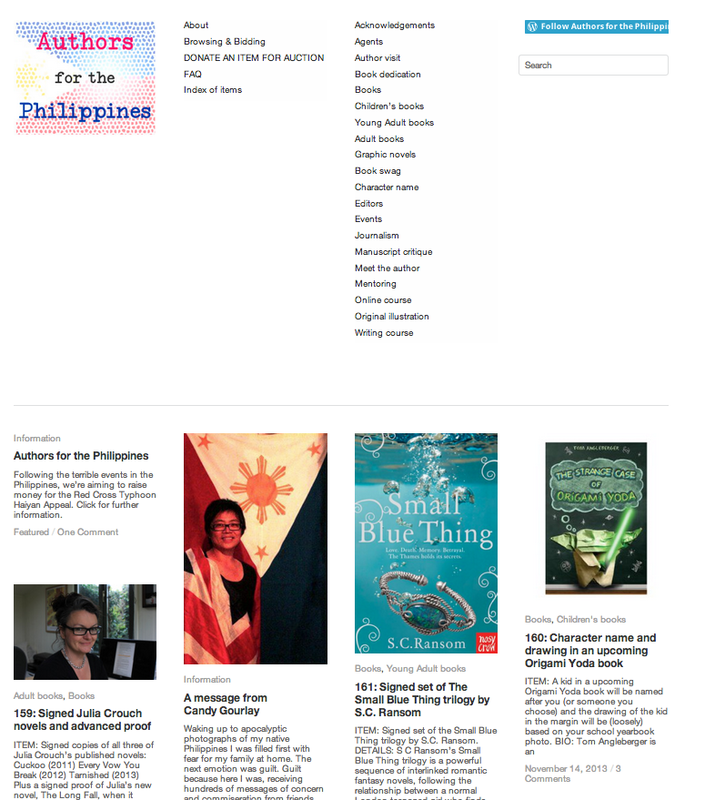 If you are an author and would like to offer an item for the auction, please email authorsforphilippines@gmail.com. But most of all, it's to help people in need. Check it out before November 20th! 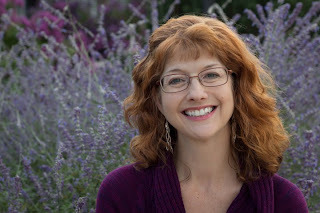 In the run-up to the 15th Annual SCBWI Winter Conference, I connected with conference faculty member, Publisher Jean Feiwel. Lee: So, Swoon Reads. What a cool idea, to create a crowd-sourced publishing arm. Jean: Yeah! It happened as a result of maybe being a fan of one too many programs like American Idol and America’s Got Talent and The Voice. I think that and a combination of watching a tremendous amount of self-publishing going on, where the authors connected directly with their readers to build their sales. Somehow, the light went off in my head and I said, you know what? This is really an interesting concept. I feel that publishers had started to create so many barriers to entry for publishing. And especially for something as straight-forward as some of the category publishing that was going on in terms of romance, and science fiction/fantasy or mystery and to watch some of the writers who were coming up strong, like Colleen Hoover and Abbi Glines, I thought – I don’t think that they necessarily would have found their way to a traditional publisher. Because, what publishers look for is more trend-based, so it was dystopic fiction or it was supernatural romance, or whatever. I think that if you’re not agented, I just think, this wasn’t going to happen. So, I thought, How do I source new talent? How do I get to people who are writing and working hard out there but aren’t going to find their way to my door? Lee: Interestingly, it sounds that it’s not purely the votes of the public. Once the cream rises to the top, you still have a curatorial role. Right? Jean: I do, and we do. But we’re really relying on the crowd to bring it to our attention. And frankly, if something is existing at the what I’d call the two heart level and I think it’s great, I’m not going to publish it. I really feel that it has got to be five hearts before we review it. And then, yes, the final judgment would be ours, but I really am believing that the audience knows best. And I don’t want to be the only one – or our team to be – the only arbiters of what would make a great book. Jean: The Heart System – we’re right in the beginning stages, and we’re finding that people either they don’t want to be critical or they’re all family and friends and they’re rating everything five hearts. Which is not good – they’re not being discerning enough. Now, I think that’s because it’s early days, and we still are in the process of learning everything. And we really are not allowing people to game the system. They can’t game the system and keep coming back themselves. We can monitor sort of who’s doing what. At the same time, we have recently added to the hearts rating system sort of what each heart means, which we did not have when we were doing beta testing. So when you scroll over one heart it says, “Not for me.” And two hearts is “It’s okay.” And three is “I like it.” And four is “Very Good.” And five is “Swoon Worthy.” That was required so people understood exactly what they were saying with the hearts and I’m thinking that’s going to be helpful moving forward. Lee: ...five stars reviews on different systems – that I won’t name right now – but it’s definitely an issue. And it means when you go online and look at reviews it makes you suspicious. Lee: It’s great to hear that you all are on top of that. Jean: Yeah, we are. And again, and this is something we say on the site, this is a work in progress and we’re learning as we go along. And we feel really confident in the set up, but to get everybody part of it and make them understand, it’s not easy, but everyday is better – the comments are much more thoughtful on the manuscripts. My feeling is, even when people post their manuscripts, they’re already getting something right back, because people are reading them and commenting on them and it’s really very helpful. Lee: I wanted to talk about that idea of instant stardom, almost Cinderella concept. Lee: It’s a very compelling narrative, but it’s not like we imagine that Susan Boyle had never sung before. Lee: She probably worked and honed, and tried to make herself sound better and better and better even if the only place she sang was in the privacy of her shower or wherever she was. Lee: What was amazing was that transformative moment, and I wonder how that plays in. We have all these different shows – there’s American Idol, and there’s The Voice and there’s The X Factor, but some of these shows are more mentoring than others. Some are ‘come and show us what you have’ and others are ‘let’s work together to make you a better artist.’ I’m wondering where you see Swoon Reads in that spectrum? Jean: We are definitely in the ‘let’s make you a better artist.’ Our whole approach is – when we find these manuscripts – when we choose these manuscripts – I don’t think any of them are going to be perfect. They’re going to require an editorial go-through. And we are building careers here and building talent. And I don’t think anything is going to be published without a degree of work that goes through it. Because, I read published books and I’m ready to edit them! …I’m not expecting to discover somebody that just comes out of nowhere. I believe that there’s going to be work done. This is something that is part of the whole concept. It’s not just, let’s find somebody and publish them -- the old way. We’re trying to do a new model. Lee: That’s very cool. Right now you’re in charge of three imprints? Jean: Yes, I’m in charge of… let’s count them: Henry Holt, Feiwel & Friends, Square Fish, and now Swoon Reads. Lee: I was wrong - Four! (laughs) What I find fascinating is that you’re doing Swoon Reads and these other more traditional versions of publishing. It’s the ‘yes, and’ version, not the replacing version. And I’m curious – to me that seems like an echo of it’s e-books and physical books, rather than e-books replacing them? Jean: That’s right. I just feel that this is a new source. Because, again, I think that publishing is at the point where it just has to become more inclusive, more flexible, in looking for the next generation of writers or whatever that is. There’s nothing wrong with agents bringing manuscripts to us. Believe me, I love it. It means they’ve done the work out there. Or there are all sorts of other ways that we see new manuscripts. But at the same time I think there are other opportunities and other ways to go. Lee: What do you see as the timeline to publish the first Swoon Reads titles? Jean: It’s funny, we were just talking about that. I am not in a rush to publish, but at the same time I think to keep the momentum and the interest high, I think that we are definitely looking to publish next year. The question is when next year. How soon can we do this in a credible way, where we do choose something, or two things, or three things, that are exciting and worthy, without rushing? I don’t want to have to fill a pipeline. I want to do right by these authors and by us. So I will say we will publish next year. Lee: And the books will be all published both as electronic books and as physical books, correct? Lee: Again, it’s the ‘yes, and’ model. Jean: Yes. Because I believe in, and Macmillan believes in, the print version. We believe in supporting bookstores, that is important to our future, to our industry, to publishing, to authors. So yes, we are committed to print publishing in addition to e.
Lee: I wanted to back up a little bit and have you explain to me, why the focus on romance? Jean: Well here’s the thing: I read Colleen Hoover’s “Slammed” maybe about a year ago, a year or fifteen months ago. I don’t consider myself a romance reader, but this was a book that I noticed was on the USA Today bestseller list, and I said, ‘what is that?’ and it says ‘published by Colleen Hoover’ so, “okay, so she’s self-publishing it” And it was like number 7 on the U.S.A. list – unbelievably high. And, we know the bestseller lists are populated – mostly -- certainly at that time, less so now – populated by brand names, so you’re looking at Patricia Cornwell, you’re seeing Nora Roberts, you’re seeing the usual suspects. So I went and got the book. I got it online ‘cause that’s the only place it was available and read it. And it’s a romance, and I loved it. What she said is “what’s so great about romance is it’s not necessarily a happy ending, but it’s an emotionally satisfying ending.” And for someone like me, who has grown up, not only in children’s publishing, but the kind of reading I do is generally morose. (laughs) Or difficult. or thorny, or complicated, rich literary works. But there was something absolutely refreshing about reading a book that just had a straight-line romance all the way through. I just loved it. It’s the mood I’m in. I felt it was not complicated. And then, like, duh! This is a whole world of publishing that has been going on for years, whether it’s Harlequin or some of these ongoing imprints, so I am very late to the party. The other thing about romance, is not only is it emotionally satisfying, but this fan base is avid. They are engaged. They follow their authors. They want to know everything about them. They want to be involved. They read voraciously. So in terms of creating a community, the romance readers are going to be there. If you’re offering them something that seems interesting and exciting, they will come. So, that’s why romance. Lee: I also wanted to say something that I was so happy to see on your site, you are open to stories of women falling in love with women and men falling in love with men, not just women falling in love with men. Can you talk about that a little? Jean: I feel that it’s a critical part of our site is to be, again, inclusive. Especially for young people at this age – we’re really concentrating on young adult romance. And I think that as kids go through the various kind of sexual explorations or changes that they go through, it’s important to be broad in what you are offering and there’s not just the traditional, again, romantic setup. We had, in our focus groups, which were small and not extensive, consistently people were interested in different pairings, of male or female and transgender. A lot of interest in that, and so that is definitely an aspect of the site. Lee: That’s fantastic. So, how many manuscripts do you have up on the Swoon Reads site now for people to read and evaluate? Jean: Now, about a month in, we have about 64 manuscripts. And we have not promoted the site very widely because… I did not want the site to crash and I really wanted to be able to manage all the kinks and make sure we weren’t going to over-promise and then under-deliver. We will keep promoting and get wider and wider – and I want more manuscripts, obviously, on the site, to give readers a whole lot to go into, but that’s where we are right now. Lee: Now you don’t imagine a single reader is going to come on your site and read all 64 manuscripts, right? Jean: So if you’re looking for a story that’s hot, you can sort by heat index, and see all the hot manuscripts. Or you can sort by the newest ones, or you can sort by lesbian. I think a reader will come on and will know what she or he wants to read and they’ll sort for it. Or they’ll start with somebody they know and then we do recommended, we say, if you’re choosing this manuscript, maybe you’d like to try these other manuscripts that are also up on the site that are also contemporary, or they’re also summer stories, or whatever. We think they’re just going to come on and browse. Lee: For those four categories on the website, Heat, Tears, Laughs and Thrills, do authors choose those or do readers say what they felt? Jean: Readers choose what they felt. Like for me, I like a good cry, so I’m going to go for tears. I’m always going to look for those. But my assistant? She doesn’t want to cry. She’s going to make sure it’s funny. Or she’s in the mood for something that’s action adventure and romance. I think those categories are going to be pretty important to people. Lee: And I like that it’s not the author saying, ‘this is a really hot story’ but it’s someone who’s read it saying, yes, there’s heat and there’s thrills. Jean: Exactly. The author gets a key note, obviously they get to describe their own book. I, for one, will certainly read what the author has to say and their description, but mostly what I’m relying on when I’m reading is that I’m looking at the comments. And I’m looking at the index. Lee: So you’re having authors create their own beta-covers? Lee: How is that working out? Jean: Oddly enough, I thought that was going to be really difficult, and people were not going to be able to do it and it was going to be a problem. But as matter of fact, it has not been a problem. People are very savvy in terms of creating their own covers. There’s only a very few who haven’t done that and who are just taking the template cover that just says ‘My Swoon-Worthy Romance.” So that’s working really well. Jean: Yeah. Again, we’re going to go back to the fans and say, okay, well you read this book, Union, with this cover on it. And this title – and there are often times when I’m looking at something and going, ‘oh my god, that’s a terrible title,’ but, maybe the fans will disagree. When we say we’re going to publish this, how does everybody feel about this title? And if the vote is, oh, no, let’s keep the title, we’re going to keep the title. And if they say, let’s not, or – I get to weigh in if there’s a split decision. If it’s a 50-50 kind of thing I think we’d be the deciding vote. But it’s really up to the fans to sort through this with us. Jean: Right! You knew this as Union, but now it’s My Big Fat Zombie Goldfish! Lee: Well that definitely sounds like an interesting romance to read! Lee: Final thoughts to share? Jean: We are really looking for writers and readers. We really want the site to work. It’s really a call for action. And that’s why I wanted to do this interview. To get fans, and writers, signed up. Lee: Specifically for members of SCBWI who write YA, who write romance, what would you like them to know? Jean: I’d like them to know that coming to the site and being part of the site is in-and-of-itself a positive experience. Because I think that your peers are not only there to be supportive and helpful and will comment on your writing in a way that I think is productive, but we are there also. We do not comment or rate manuscripts, because again, it is up to the fans to do that, but we are reading all the time. And we have our own conversations about the manuscripts that come up. And we also try to promote through social media – if a manuscript isn’t getting read enough, we will send out a call saying, ‘hey, have you checked out this new manuscript called ‘butterfly kisses?’ It’s really something you should take a look at.’ I think that, again, it’s not you’re being published, but you are being read. And I think that’s important. And that’s many many steps away from where you are right now if you’re unpublished and just writing. Lee: And it’s an opportunity to be Susan Boyle. Jean: That’s right! And you can be discovered. I always say, be careful what you wish for because it can be overwhelming and amazing. But it’s also… it can be somebody’s dream come true. And that’s really our hope: Is to make somebody’s dream come true. Lee: Wonderful. Jean, you’ve been so kind. Thank you so much for taking the time. To hear Jean on the Future Of Authorship panel and take part in all the craft, business, inspiration, opportunity and community that SCBWI offers, join us at the SCBWI Winter Conference in New York City. Details and registration here. To find out more about Swoon Reads, visit their website here. With the surge of e-books and other digital and screen versions of books, one possible outcome for the publishing future is that physical books will become more designed, more "object," more special. An example of this possible future taking shape is J.J. Abrams' - the director of both the Star Trek and now the Star Wars franchises - and the novelist Doug Dorst's collaboration, "S."
This being Mr. Abrams, “S.” is not a normal book. Inside a black slipcover stamped with the title, there’s an old library edition of a novel titled “Ship of Theseus,” published in 1949 by a certain V. M. Straka. 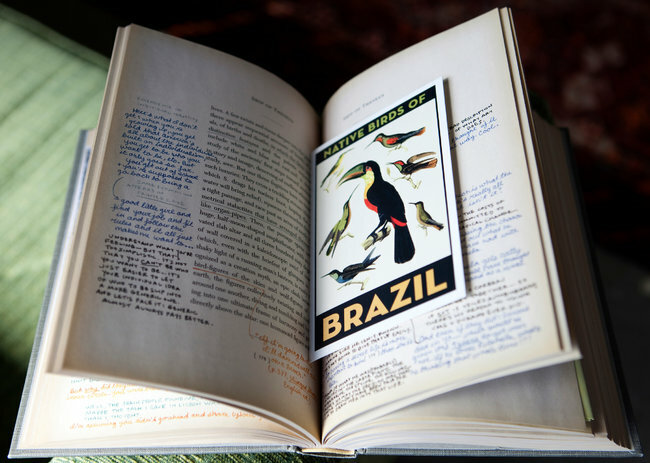 The author and novel are the fictional creations of Mr. Abrams and Mr. Dorst, but the book’s edge-worn spine, labeled with a faded Dewey decimal sticker, is scuffed, and its corners dented. In used-book selling parlance, the condition of “Ship of Theseus” might be rated “good,” were it not for the tens of thousands of words tattooed in the margins of its yellowed pages by at least two different hands, both in pencil-lead gray and a riot of inks: black, blue, red, orange, purple and green. Tucked among the pages, readers will find handwritten letters and notes, a college newspaper clipping, a purple mimeographed telegram, photocopied book pages, postcards, an old photograph, a map scrawled on a coffee shop napkin, and even a throwback decoder ring. “We took every advantage of publishing and the fact that it is an object,” said Mr. Abrams, who collaborated with the publisher Mulholland Books, an imprint of Little Brown & Company, and the design firm Melcher Media. There will be a digital e-book and related materials scattered online for obsessive fans, but to get the full 3-D sensory experience, Mr. Abrams recommends the hardback. It will be fascinating to see if this gives more support to books for children and teens that are also multi-layered physical objects of literary art. No Query? No Pitch? That's No Problem For This Contest. 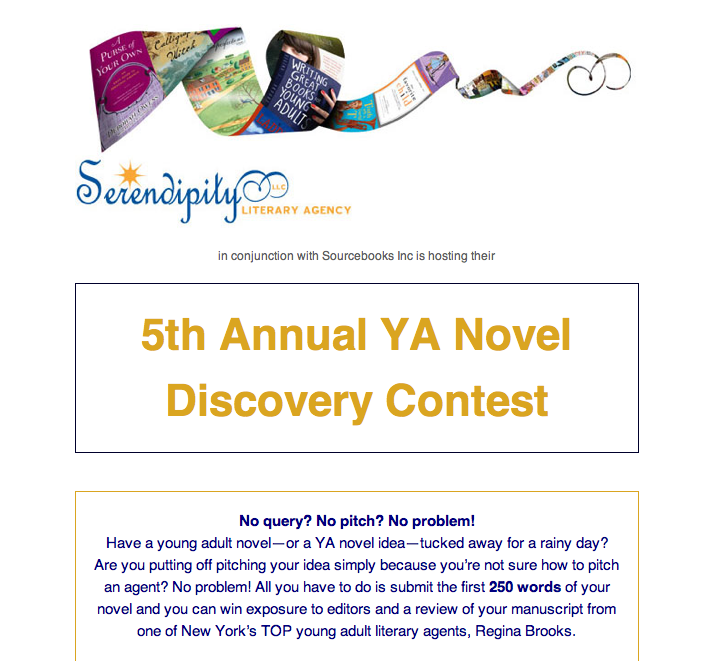 For the fifth year, Serendipity Literary Agency and Sourcebooks Inc. are hosting their YA Novel Discovery Contest. The idea being that querying and pitching are different skills than writing, and this is a chance to have the first 250 words of your YA novel speak for themselves. Last year’s winner, Lori Goldstein, received a two book deal. Her first book BECOMING JINN will be published by Feiwel and Friends. Check out the contest details (including the prizes and the editors who read the top 20 submissions) here. 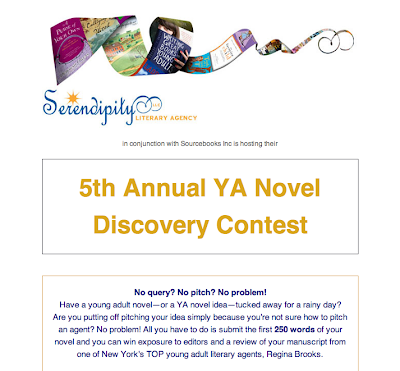 Labels: contest, Serendipity Literary, Sourcebooks Inc.
National Novel Writing Month keeps a tally of participating novelists! Of course, a first draft of a novel is just that - a first draft. But if you've been having trouble getting that first draft on the page so you have something to revise (and ultimately, make amazing) NaNoWriMo may just be the motivation you need! Illustrate and Write (that novel) On!